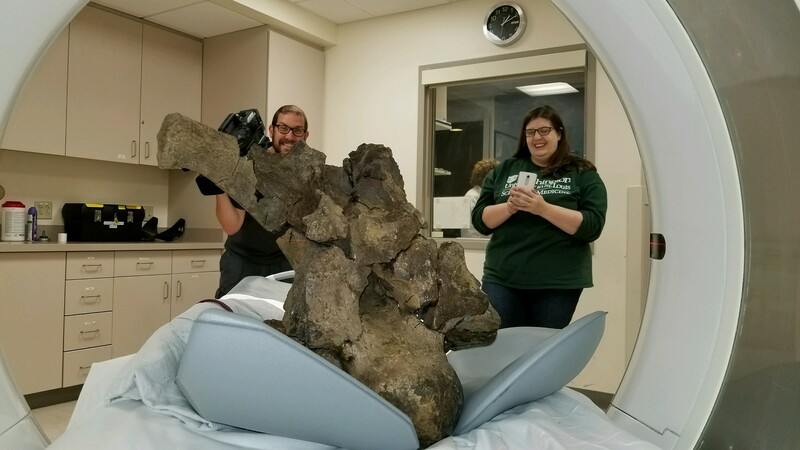 Earlier this month, the CT scanner at the Washington University School of Medicine received some unusual patients: two Triceratops skulls! By probing the interior of the fossils, these scans will help palaeontologists get inside the dinosaurs' heads. Studying dinosaur brains is not easy, especially since the soft and squishy bits themselves are long since decomposed away (except for that one time) – but that's not stopping Ashley Morhardt of Washington University's Department of Neuroscience. "Palaeo-neurology is doing neurology without neurons," Morhardt says. "Dinosaur brains don't fossilise, so we have to look to other sources of evidence to inform our understanding of what dinosaur brains looked like." The brains may be gone, but the braincase – the compartment of the skull that held the all-important organ – remains. The shape of that chamber can give palaeontologists a sense of the dimensions of the brain regions and associated tissues, and the numerous channels running through the skull bones reveal where various nerves and blood vessels ran to their designated parts of the brain. In some cases, an impression of the brain's surface can even be left on the inside of the skull! Braincases are most informative when they're largely preserved, but that also makes them difficult to explore without having to crack open some heads (literally). That's where CT scanning comes in. 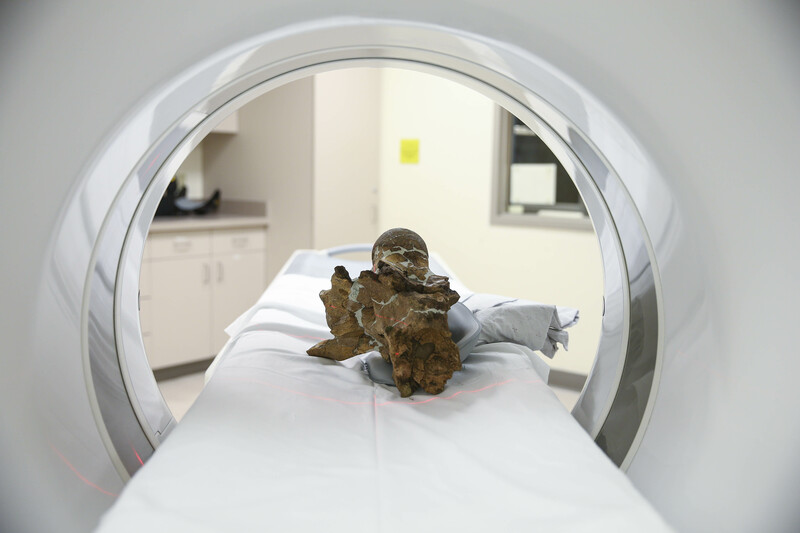 With a scan of the interior chambers, researchers can fill in the empty space to create an endocast, a 3D model (virtual or physical) of the inner shape of the braincase. From there, palaeontologists collect all the data they can from the fossils, then turn to modern-day brains to guide the next step. 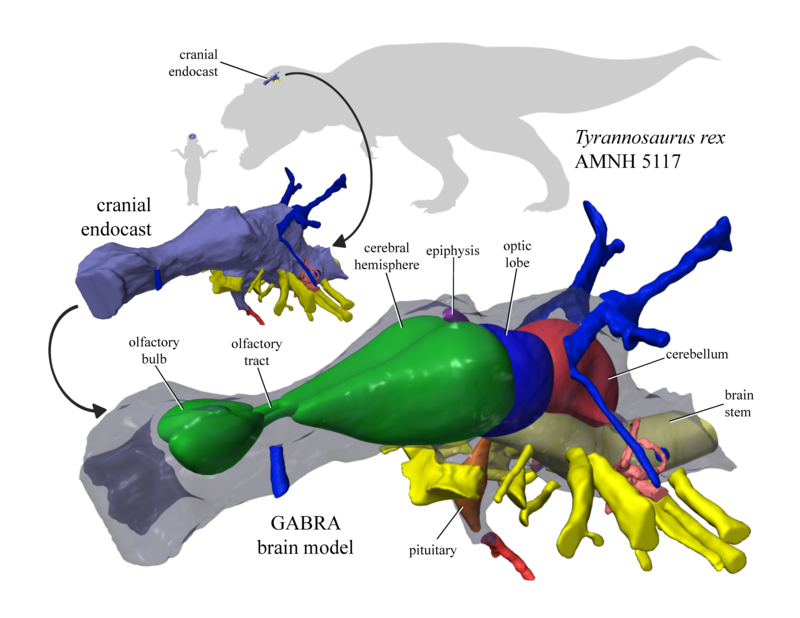 "I can use the endocast as a road map for reconstructing the size and shape of the brain based on what we know about modern-day dinosaurs – aka birds – and their relatives, alligators and crocodiles," Morhardt explains. In this case, she's planning to map out the brains of the two juvenile Triceratops, which both came from the Hell Creek Formation of Montana, more than 65 million years ago. Figuring out how the brain regions relate to skull shape and the trajectories of the nervous and circulatory system is crucial, and not easy. "It's challenging," she says. "It takes a lot of time to get to know these blood vessels and cranial nerves." This approach can't quite tell us how smart an extinct animal was – that's a complicated and controversial question – but it can unveil a surprising amount of information about how that creature interacted with its world. In T. rex, for example, the olfactory centre of the brain was highly developed, suggesting the tyrant king had a particularly acute sense of smell. Expanded optic lobes in a dinosaur (along with information about the eyes) might indicate great vision, and the details of the inner ear region can provide clues to factors like hearing, balance and even the posture of the head. But with these young Triceratops fossils, Morhardt and her colleagues are hoping to go a step further to investigate how these dinosaurs' brains changed over the course of their lives. Developmental change (ontogeny) is very important in living birds, and can shed light on questions of ancient dinosaur life history: a well-developed brain at a young age might represent a species born ready to face the world (compared to many helpless baby birds), and a change in brain structure early in life might indicate a change in behaviour, such as the onset of sexual activity or a new style of finding food. The transition from young to old Triceratops is actually well understood in many respects, but the brain is not yet one of them. "We know a lot about the ontogeny of Triceratops from other features, things like the facial skeleton and the frill," Morhardt explains. "It would be really interesting to see if these changes in the facial skeleton are reflected in the brain." And dino-brain research can get even broader than this; by comparing brains between species, palaeontologists can examine long-term patterns of brain evolution, and investigate the implications of changing brains. Recent research published earlier this month revealed patterns of dramatic brain and skull evolution across the tens of millions of years of generational change that produced modern birds from ancient reptiles. "Studying evolutionary changes in brains can help us understand more about how modern animal brains (including us) came to be," Morhardt says. Fossils of dinosaurs and other ancient creatures unearthed from 70-million-year-old rock in Madagascar tell a potentially toxic tale. What killed the dinosaurs in this fossilised mass grave?